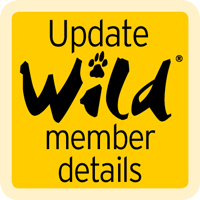 To complete your membership application and ensure you receive your Wild Card and Wild magazine in the mail, it is vital that you record your personal details online. Please login to update your membership. Your Wild Card is personalised with your name and sent to you by registered mail. To prevent unnecessary delays, please ensure that your membership information, particularly postal address, is absolutely accurate. If you change address or close your PO Box, be sure to update your membership details, so we can continue to send Wild magazine to you. In order to enter your personal details or to verify details previously captured, you will be connected to the database hosted on the SANParks website. Click the button below to proceed.